packaging products. The growth in population with increasing disposable income is driving the market. market. 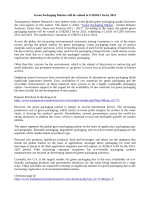 Whereas, instability in raw material cost act as a barrier for the antimicrobial packaging market. chain analysis, porters five force analysis etc. enormous demand for healthy products in order to fulfill requirement from the increasing population. 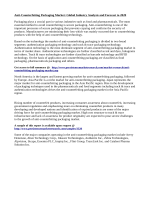 convenience and packaged foods & beverages. 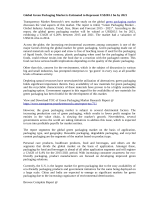 the Asia-Pacific region witnessed major growth and becomes a large market for packaging solutions. packaging technologies and the use of recycled material are driving the market in Europe. Microban International, Oplon Pure Sciences Ltd. and Takex Labo Co. Ltd.
(3R), Continuous-Feed Research (CFR), and Market Research & Consulting Services. know more, and do more, which help to answer all their most important questions. meet with the industry experts and industrial visits for its research analyst members.